His name is David Adam Pate, he is 24 and a South Carolina resident and his horrible mug shot, terrifying and chilling, rivals the craziness seen in Charles Manson at the time of his arrest and every subsequent picture since. Pate was charged with killing his “friend” 33 year-old Ricky W. James, who was discovered by children who found his decomposing body when they were playing. Pate can be seen slightly smirking while sticking out his forked tongue, which was reportedly surgically split. 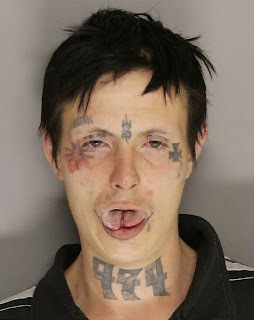 He also has several tattoos on his face, including “SATAN” over one eye and the numbers “974â€³ on his neck to reference the street gang Gangster Disciples. His mug shot from a Google image search is shown below.